DEVELOPED ON THE FASTEST RS FOCUS IN THE WORLD! Developed and tested on Paul Hamling's 390BHP record breaking Focus RS. 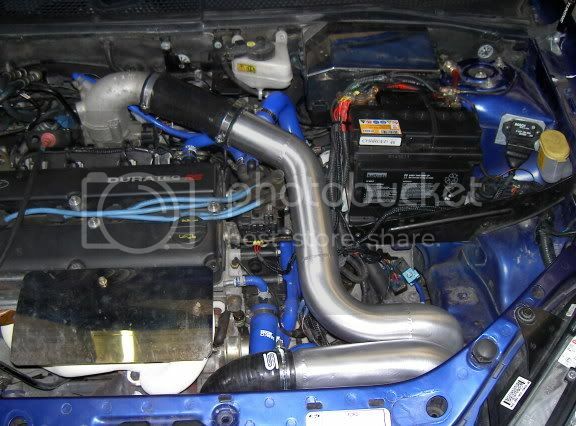 WRC style front mount intercooler kit. On a standard car the charge cooler kit is actually quite effective. However when tuned , the greater heat output from the engine saturates the water system and therefore intake temperatures soar out of control. On mildly tuned engines this situation can be eleviated by using a larger Pre-rad , however, the system still has its limits and with sustained use on higher powered vehicles, temperatures still climb to scary levels. 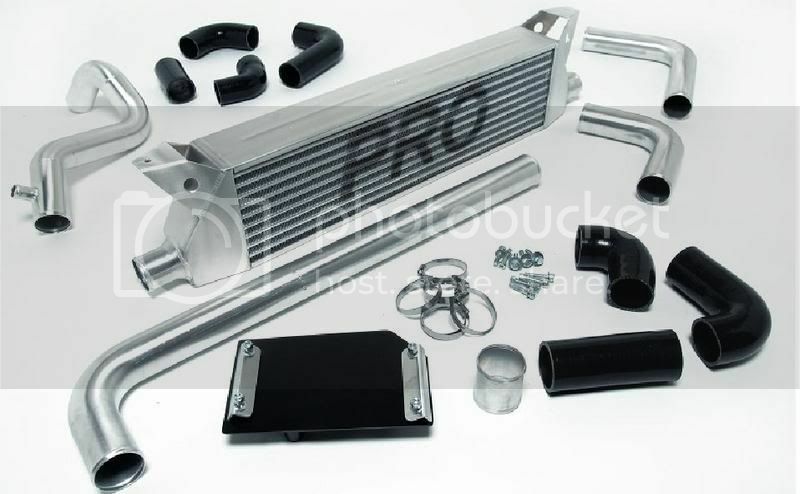 Therefore we have developed this huge front mount intercooler kit. This is probably the most comprehensive kit we have produced yet with performance to match! The original charge cooler kit is completely removed and the battery is re-located with our alloy battery tray to the position where the charge cooler was. We also re- locate the air filter (a cone type filter must be used), this allows the filter to draw cold air from under the bumper and not hot air from the back of the radiator! Re-locating these parts also helps with water radiator temperatures due to increased air flow on the rear of the radiator. Our test car ran 6 degrees cooler on water temps with the new intercooler fitted on a 6 degree hotter day. we also saw a significant rise in boost pressure indicating that the new cooler was flowing with less restriction than the original charge cooler set -up. Air intake temperatures are stabilised and settled at a peak of 45degrees on our test car down from 54 and rising with the std set up. The test was performed with a 24 degree ambient temperature on the standard system and 32 degrees (18/7/06) with the pro alloy cooler . The kit is supplied complete and ready to fit. Fitting can be performed at home as there is no welding or cutting required. You do not need to turn the turbo housing with this kit.